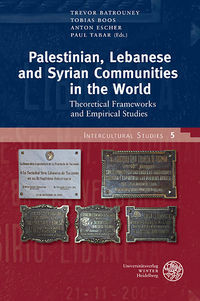 The existing global connectedness of migrants and their descendants from contemporary Lebanon, Syria, and ancient Palestine is the outcome of the migration history of this region, which commenced in the middle of the 19th century. Today people from this region are as well part of different societies all over the world as well as part of global communities. The contributions of this volume discuss the experiences of “living-between-cultures” that these people do in times of globalization from an interdisciplinary perspective; namely from geography, history, political science, social anthropology, and sociology. Scholars from Australia, Austria, Brazil, France, Germany, Great Britain, Jordan, Lebanon, Mexico, and the United States of America present their empirical findings and examine theoretical key concepts and notions like diaspora, transnationalism, communitas, habitus, social network, and new media.